Over the past four decades here at Titan Machine we’ve seen various trends in elevator equipment design and repair practices. Onsite diagnosis and piece meal repair of a geared traction machine can be time consuming and costly, lead to inconclusive results, and ultimately fail to identify or repair failing or damaged components. Increasingly, our customers are foregoing that process and choosing to ship entire machines and mechanical assemblies direct to Titan for tear down and overhaul. 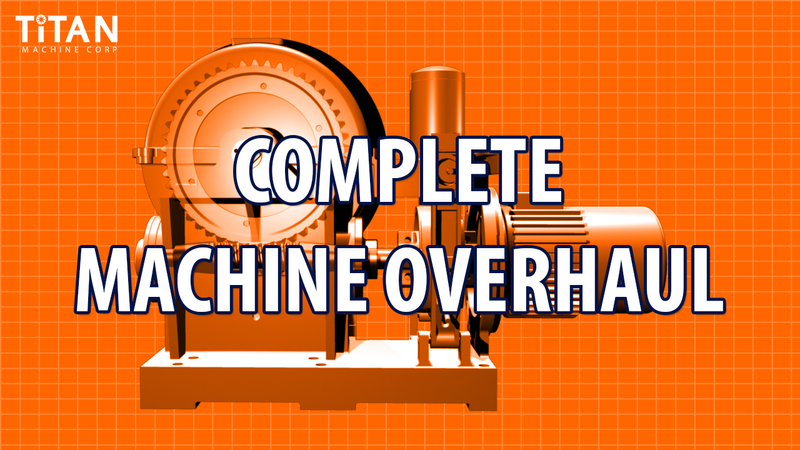 When compared to modernizing the entire hoistway system, our complete machine overhaul is a less expensive and faster option for contractors and building owners alike. At Titan, we’re capable of manufacturing or repairing nearly every mechanical component in the elevator system. With machining capabilities that enable us to reproduce or reverse engineer seemingly obsolete parts for centuries old equipment, we are uniquely capable of providing a complete machine overhaul service to our customers. We start by completely disassembling and cleaning every component of the assembly. Thereafter we carefully inspect each part. Taking into account reported symptoms or known damage, we then begin the process of repairing and/or manufacturing new components to address the known and newly discovered issues. Additionally, all wearable components are replaced including oil seals, bearings and bearing surfaces including bronze and babbitt sleeves. Once all the components are expertly assembled and tested, your machine is painted and prepared for shipping back to you in brand new condition ready to be bolted back in place with minimal field adjustments. Whether your machine or assembly requires a new sheave, worm and gear, a new spur or bevel gear, bearings, bronze, or babbitt work, needs a new motor adapted and aligned, or has a major component failure requiring replacement like a fractured shaft or spider, Titan has the industry specific technical know-how and decades of manufacturing and machine shop expertise to eliminate your headaches. At Titan, we’re committed to keeping your job on time and ahead of schedule all while never sacrificing on quality. Give us a call today to discuss your next machine overhaul needs.